Serena's Guide to Palmistry. Hand Reading. Hand Analysis. The history of palmistry probably dates back to prehistoric times. The Chinese (see Chinese Palmistry) were known to have already been using palmistry 5000 years ago. Aristotle mentioned palmistry in his writings around in the 4th century BC. The science of palmistry was also studied by the Romans, Indians (see Vedic Palmistry), Arabs, Hebrews, Malays and Egyptians. Nowadays, there are two distinct approaches to palmistry. Cheiromancy embraces the fortune-telling approach and refers to the lines on the palm of the hand. Cheirognomy, also known as hand analysis, concentrates on discerning the strengths and weaknesses of the personality from the shape of the hand. This branch has also come to include the study and meaning of dermatoglyphics (finger prints) and skin ridge patterns. Many readers prefer to blend the two approaches in a mixture of old and new. With the proliferation of palmistry websites available I have decided to limit myself to describing a few of the more unusual and lesser known palmistry tidbits. 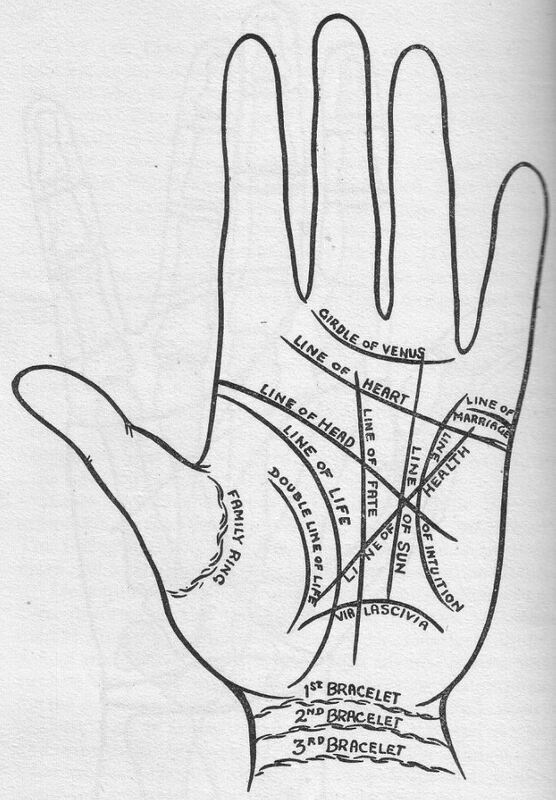 But if you are unfamiliar with the major lines on the hand, click here for a diagram showing the position of the Life Line, Head Line, Heart Line, Sun Line (Apollo Line), Fate Line (Saturn Line), Health Line (Mercury Line), Via Lascivia, Girdle of Venus, Family Ring, Line of Intuition, Marriage Line and Second Life Line. Those who enjoy a psychological approach to palmistry, should explore Arnold Holtzman's excellent site on Psychodiagnostic Chirology. The Minor Lines are the lesser known lines that may not appear on all hands. These lines are fascinating as they add more information than can be gleaned by just examining the Major Lines. Wearing a ring on the index finger shows that you want to be the boss. Wearing a ring on the middle finger shows that you are constantly concerned with issues of security. On the ring finger, a ring shows an interest in matters of the heart. On the little finger, a ring reveals an interest in communicating and business. A ring worn on the thumb shows a wish to control situations, often through passive aggression. Which thumb ends up on top when you cross your hands? If the right thumb ends up on top, you are more analytical and logical than creative. You prefer to plan than to go with flow. The left side of your brain dominates. If the left thumb remains on top, you are the creative type who doesn't get fazed by having to act on the spur of the moment. The right side of your brain dominates. Is your little finger bent or twisted? If it does, you can be very crafty and manipulative. I hope you use it for good not evil. Does your little finger curve away from the hand? You are not afraid of experimentation or a little kinkiness. What a daredevil! When you hold your hand loosely on the table or your lap with the palm facing upwards, does your little finger curl inwards? If it does, you are hiding a secret. Probably a biggie too. Do you have a very short little finger that twists sharply towards your ring finger? You find lots of trouble forming and maintaining relationships. Start by being honest with both yourself and others. Does your little finger stick out away from your hand when you splay your hand? You have a strong need for independence. You often have trouble getting on smoothly with other people. You need to learn to be less exacting. Is your little finger extremely thick? Most people have white spots on some or all of their fingernails. A large amount of white or grey specks indicates periods of stress and fatigue and a possible imbalance of zinc in the system. Single spots also have specific meanings depending on which fingernail they appear on and their position on the nail. The base of the nail is the future, the middle of the nail is the present and the top of the nail is the past. Appearing on the thumb, a white speck foreshadows a present or gift. A white spot on the index finger reveals the influence of a good friend. A spot on the middle finger reveals the actions of an enemy. A spot on the ring finger indicates a new lover or marriage. A spot appearing on the little finger shows a journey or short trip. A blue spot on the nail predicts misfortune.